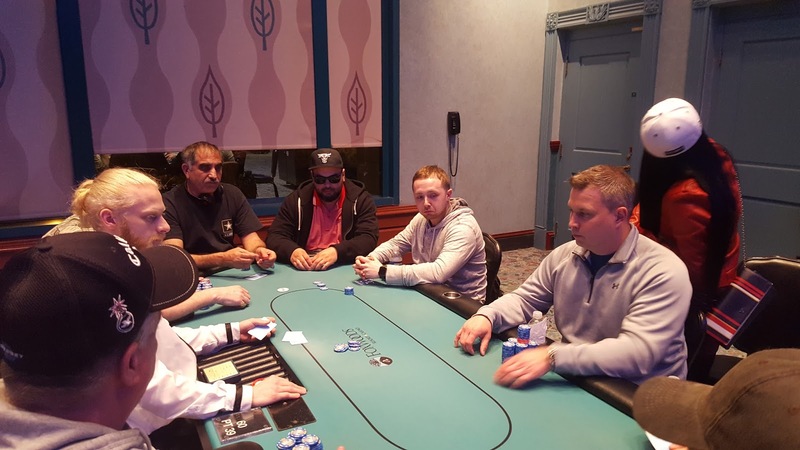 A few hands ago, Marty Gorenc doubled up Thomas Dragone and was left very short. This hand, Manny Okrah raises to 75,000 in middle position, Aaron Braham reraises to 225,000, and Gorenc shoves all in for less (65,000 total). Okrah thinks for nearly a minute before calling the raise. Okrah and Braham both check it down as the board runs out 9♠9♣6♦Q♦3♦. Braham turns over A♥K♦ for ace king high, Gorenc shows A♠3♣ for a pair of threes, but Okrah shows A♦Q♥ for a pair of queens to win the hand, and eliminate Gorenc in 9th place. 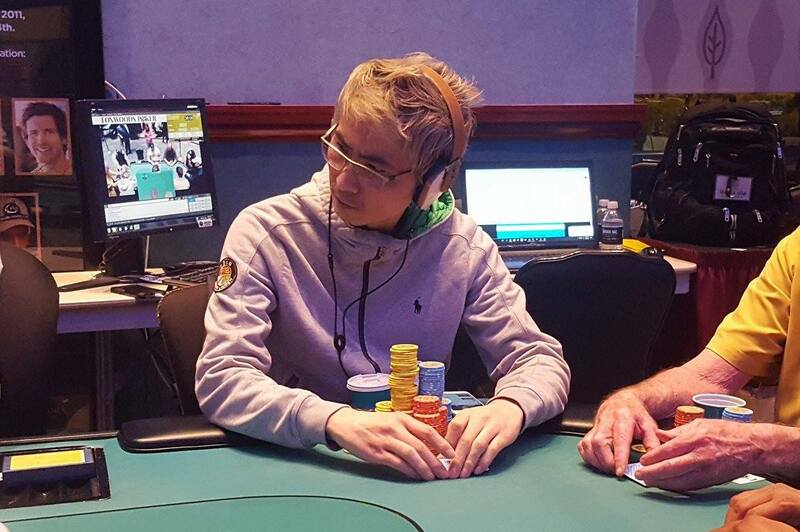 Je Wook Oh raises to 80,000 in the hijack, and John Caputo reraises to 250,000 in the cutoff. It folds back to Oh who shoves all in, and Caputo asks, "How much more?" The dealer pulls in the 250,000 from each player, and tells Caputo it's 815,000 more to call. Caputo quickly calls. Oh turns over A♥K♠, and Caputo says, "Classic," as he turns over Q♥Q♣. 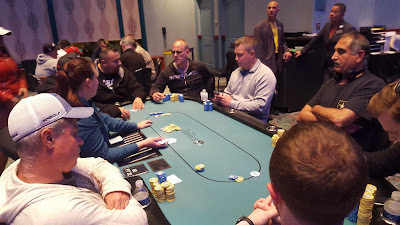 The board runs out 9♦6♠2♥8♠3♥, awarding Caputo the pot, and eliminating Oh in 10th place. Jovy Ounthongdy is all in from under the gun for around 600,000, and has been called by Manny Okrah in middle position. The board runs out 8♥2♥2♦2♠6♣, awarding Okrah the pot, and eliminating Ounthongdy in 11th place. 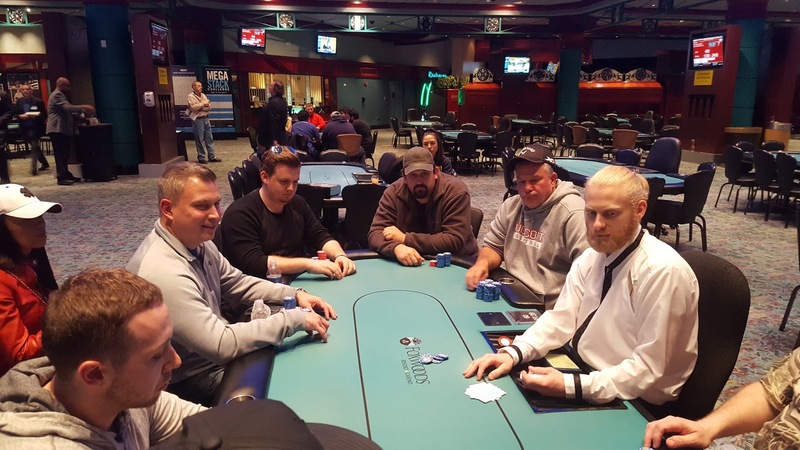 The final ten players are now redrawing for their seats at the final table of ten. Dena Pearlman raises to 60,000 in the cutoff, and Manny Okrah reraises to 200,000 in the small blind. Pearlman calls. The flop comes A♥10♥2♠. Okrah leads for 250,000, Pearlman raises to 500,000, and Okrah shoves all in, having Pearlman covered. Pearlman snap-calls, and the players table their hands. The K♠ turn and 3♥ river are safe for Pearlman to double up. 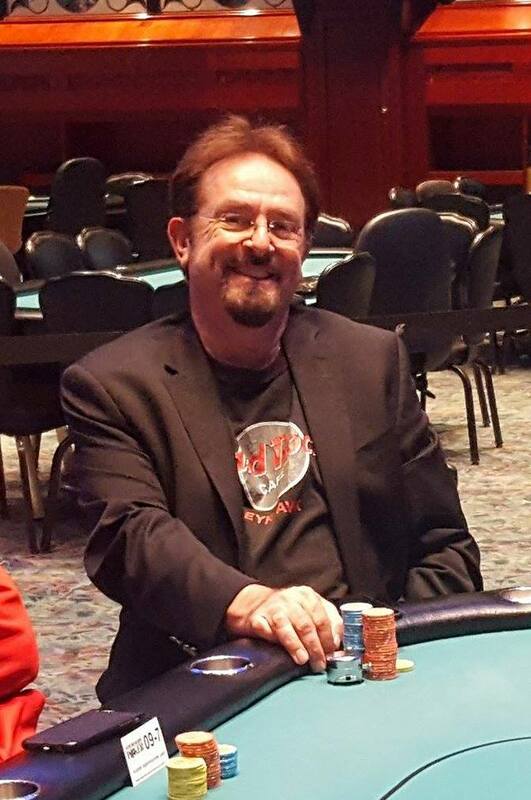 The dealer counts out Pearlman's 1,420,000, and Okrah sighs heavily as he count out the chips from his stack and passes them forward. Pearlman has just taken down one of the largest pots of the day, and the chip lead. 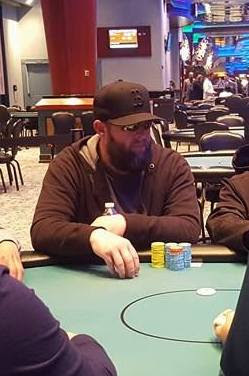 Tyler Loranger shoves all in on the button for around 250,000, and Thomas Dragone calls in the big blind. The board runs out Q♥10♣8♥2♥7♣, awarding Dragone the pot, and eliminating Loranger in 13th place. LJ Sande raises to 70,000 from under the gun. 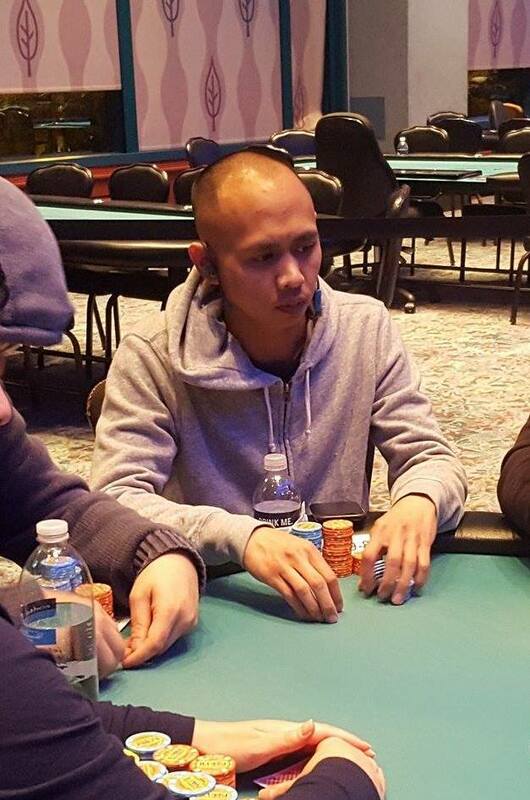 It folds to Zhi Wu in the hijack who shoves all in for 172,000. The button and small blind both fold, and Steven Fiorentini shoves all in from the big blind. Sande asks for a count of Fiorentini's stack, and upon hearing the 635,000 total, Sande goes deep into the tank. Nearly three minutes pass before Sande tosses in a chip to call, and the three players table their hands. 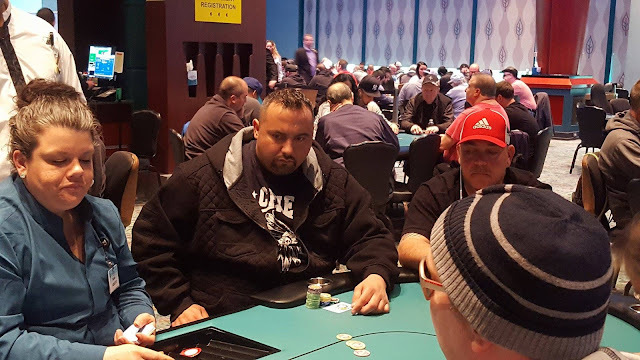 The flop comes K♣3♣2♣, leaving Sande in the lead, but giving Fiorentini a flush draw. The J♣ turn gives Sande a set of jacks, but also gives Fiorentini a flush to take the lead. The 2♥ river pairs the board, giving Sande a full house, and both of his opponents are eliminated from play. There is around 400,000 in the middle, and the board reads K♥8♦3♦Q♥. LJ Sande shoves all in, and Zhi Wu quickly calls. 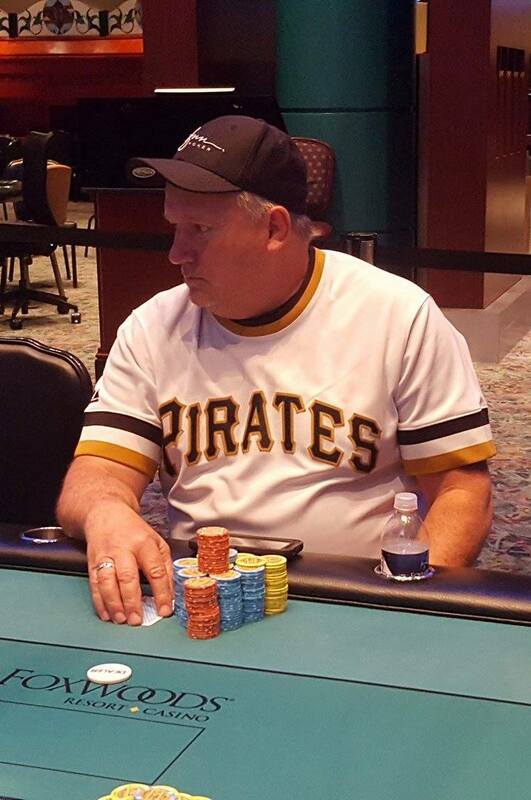 The Q♠ river is safe for Sande, and he doubles up. The board runs out Q♥Q♣J♠10♥5♣ awarding Patel the pot, and eliminating Maddock in 19th place. 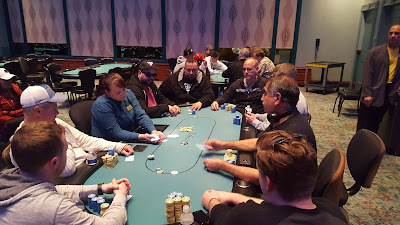 The final 24 players are now on a 60 minute dinner break. They will return to play Level 23, with 8,000/16,000 blinds and a 2,000 ante. Play will resume around 7:40pm Eastern Time. 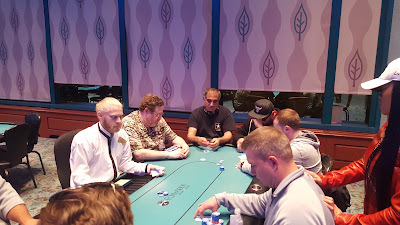 There is a commotion a few tables over, and one of the players from the table comes over to tell the foxwoodspoker.com blog staff that there is a three way all in. When the blog staff arrives to the table there is a board reading K♥6♠5♠5♣A♥ and the dealer is counting down the three players stacks. The 5♣ turn did not change the hand, but the A♥ river gave Pearlman the best hand with her two pair, and she tripled up, while Zyberman won the small side pot. 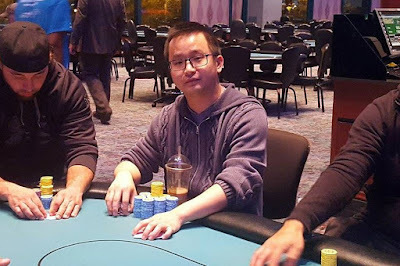 Zhi Wu raises to 30,000 from under the gun, and Je Wook Oh re-raises to 88,000 in the cutoff. It folds back around to Wu who calls. The flop comes 10♠7♠4♥. Wu checks, and Oh asks Wu to see his stack. Wu moves his hands back, and Oh quickly moves forward a large stack of chips totaling somewhere around 400,000, and Wu snap-calls for less. The 9♣ turn and 7♥ river are safe for Wu to double up. The dealer counts out his remaining 210,000 in chips, and Oh passes the chips forward. There is around 80,000 in the middle, and the board reads 6♣5♥2♦. 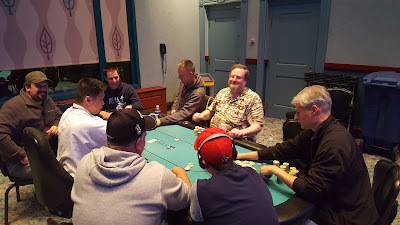 JeWook Oh bets 60,000 from under the gun, and Jon Maclellan raises to 110,000 in middle position. 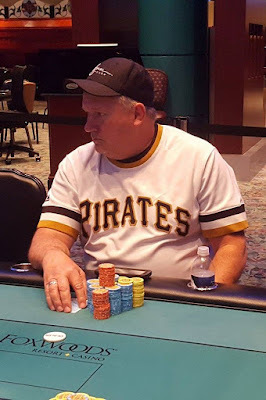 Oh pauses for nearly thirty seconds, and then moves forward a large stack of chips totaling somewhere around 600,000, and putting Maclellan to the test. Maclellan pauses for over two full minutes, staring back and forth between his chip stack, and the board in front of him, but ultimately opts to fold. Oh shows J♥J♦, and Maclellan just nods his head as they move on to the next hand. There were a total of 212 entries in today's $300 No-Limit Hold'em Big Stack event, generating a prizepool of $53,466. The top 24 places will make the money, with first place taking home $12,993. Jovy Ounthongdy just won a monster pot against Zhi Wu to push him just under the 1,000,000 mark. Ounthongdy rivered a full house holding A♣Q♥ on a board reading A♥K♥Q♦6♣A♠. Wu called Ounthongdy's river bet but quickly mucked his cards upon seeing Ounthongdy's full house. Players are just returning from their first break of the day. 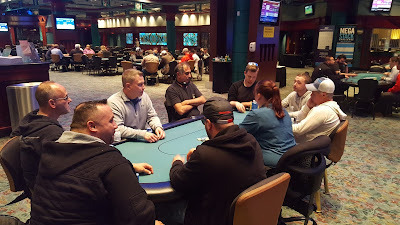 They will return to play Level 6, with 150/300 blinds and a 25 ante. As a reminder, registration is open until the start of Level 11, so anyone wishing to enter/re-enter has until then to do so. 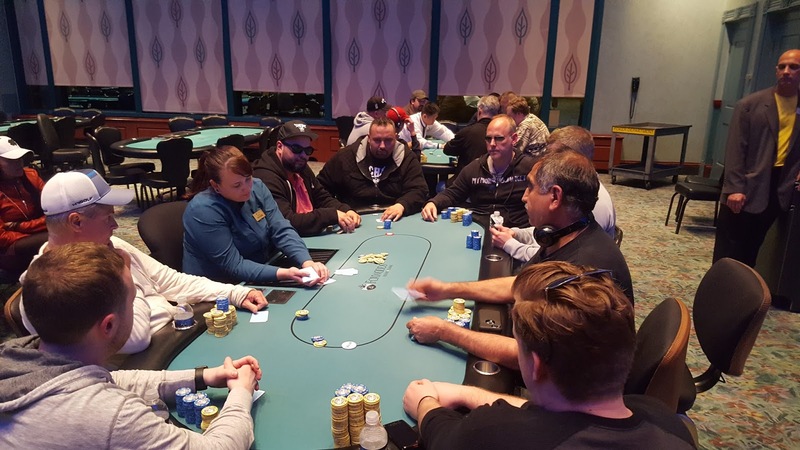 This tournament boasts a $25,000 guarantee, and will play to a conclusion tonight. There is around 16,000 in the middle, and the board reads K♣7♣5♥. Marc Evanier checks in the small blind, Paul Radochia checks in the big blind, and Dilip Kumar Patel bets 9,000 in middle position. Evanier calls, and Radochia shoves all in. Patel asks for a count, and upon hearing the 56,000 total, he opts to fold. Evanier tanks for nearly two minutes before hesitantly moving chips forward to call. Radochia calls for an ace as the turn comes the 2♠, and the river the 4♦. "Yes," Radochia says enthusiastically as the chips are passed over to him. April Than shoves all in from under the gun. It folds to James White in middle position who calls, and all remaining players fold. The flop comes A♠K♥K♦. The turn is the Q♥ and one of the players at the table says, "Oh, you even hit your straight," even though Than is now drawing dead. The river is the inconsequential 5♠, and Than is eliminated in 91st place, taking home $1,200. For a full list of all advancing players please see this link. For prizepool information, please see this link.